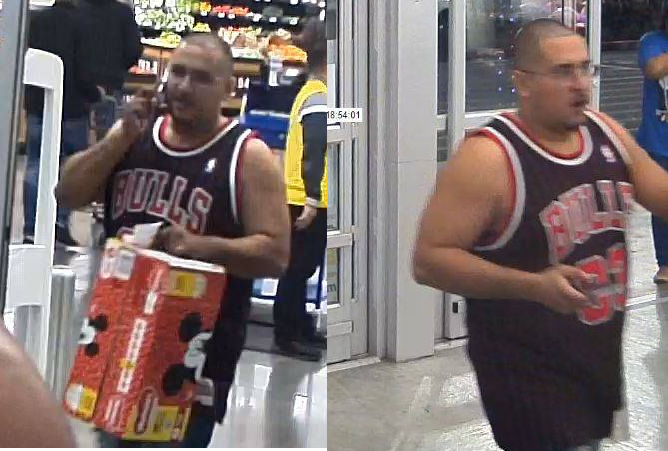 The Elk Grove Police Department has released surveillance photos of a suspect wanted for burglarizing a car and using stolen credit cards. On Tuesday, January 29 around 6:30 p.m., the victim was observed placing her purse in the trunk of her car on the 3400 block of Laguna Boulevard. An unknown suspect shattered a window, gained access to the trunk and stole the victim's purse. Within a half hour of the theft, the stolen credit cards were sued for purchases at a South Sacramento store. The person using the credit cards was captured on a surveillance camera. The suspect appeared to be a Hispanic male in his mid-20's to mid-30s, 5-09 to 6-00 tall, about 200 pounds. He had dark hair which was closely shaved and a faint mustache and goatee. The suspect was wearing clear eyeglasses, a black with red trim Chicago Bulls number 33 jersey, blue jeans, and red shoes. The suspect vehicle was a black SUV with chrome molding on the side and black wheels. 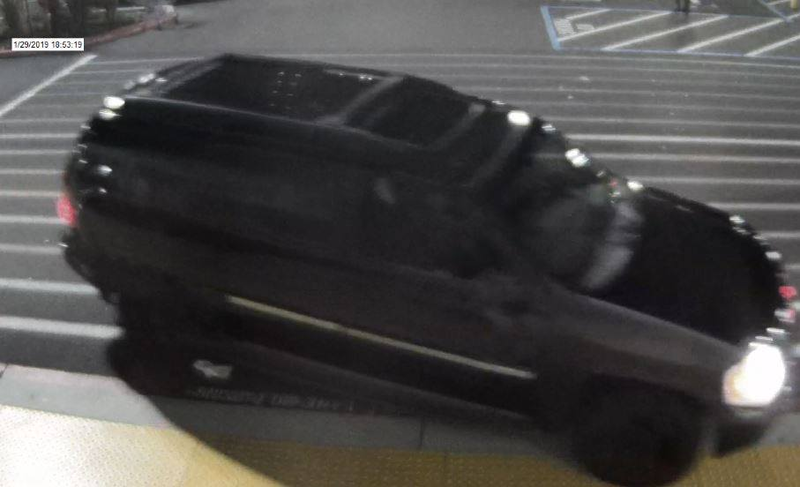 The SUV appeared to have a luggage rack, and the right front fender looked to have black primer paint (see below). Anyone with information regarding this investigation is asked to call the Elk Grove Police Department Detective Bureau at (916) 478-8117 or Crime Stoppers at (916) 443-HELP (4357). Callers to Crime Stoppers can remain anonymous and may be eligible for a reward of up to $1,000.00.